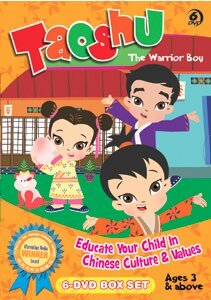 Taoshu DVD Set (6 DVDs/set) - English DVDs. Tao Shu loves to dress-up as a brave warrior, solve problems and help people. He’s energetic, adventurous and has a big imagination, which sometimes gets him into all sorts of funny situations! If you are interested to purchase Taoshu DVD set in Chinese, please click here.